If you love Angry Birds, you will be happy to know that Rovio has a major update. The new Angry Birds Rio Carnival Upheaval update is coming soon to iOS and Android. 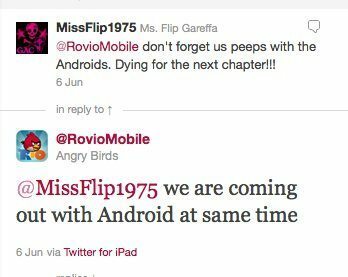 If you look below you will see a screenshot we did over on Twitter, the screen shot shows Rovio answering a tweet message from @MissFlip1975, they asked basically not to forget Android users and Rovio replied saying “We are coming out with Android at the same time”. The Angry Birds Carnival Upheaval update will be coming very soon and will feature 15 levels in new world named Carnival Upheaval, Blue, the Macaw, can now be used alone and there will be hidden fruits called papaya. We have search the net very hard indeed and cannot find that the update is live, even though some sites suggest you can get it now. Please be patient and we will let you know when the official update is live. Please watch the YouTube below provided by RovioMobile, and comments you have are most welcome below. Why you’re at it please do like us Facebook, join us, share us and please do use our very NEW Google +1 button.